NIS Musical by the great Dr.Seuss! The show’s finally come, now it’s time to let loose! It’s the NIS Musical by the great Dr.Seuss! We would like to invite all of the NIS community to attend this year’s musical production: Seussical Jr. Taken from the famous Dr. Seuss story ‘Horton Hears A Who,’ this story is about a brave elephant who tries to save the tiny universe of Whoville. 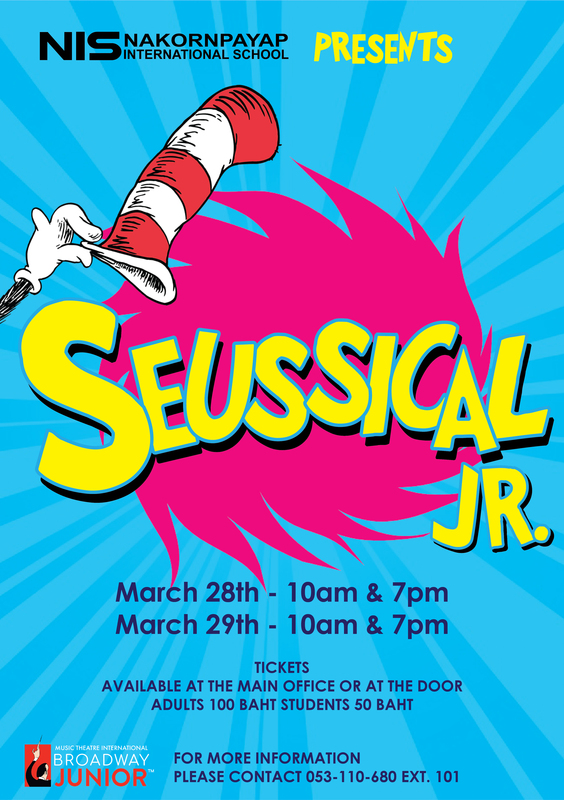 This production showcases students from grades 3 to 12, and promises to be an exciting, heart-warming and entertaining show for the whole family. The final performances are Thursday March 28th, and Friday March 29th at 7:00pm in the NIS Auditorum. Tickets are 100 baht for adults and 50 baht for students. Please come out and support the hard work of these talent young performers!